The Roland RE-201 Space Echo was the tape delay that inspired a generation of synth-heads and guitarists alike, with a sound that literally came from another dimension – pay close attention! One of the things that I’ve always liked about the Eurorack synth industry is the eccentric naming that some modules have, often leaving no clue as to what the product actually does. Of course, I can hear the non-modular heads shouting: “What’s the point in an obscure product name?” Well really, there’s none at all. But what it does do is offer that cool quotient, either in the name itself, or in the sheer fact that only you will know what it does. 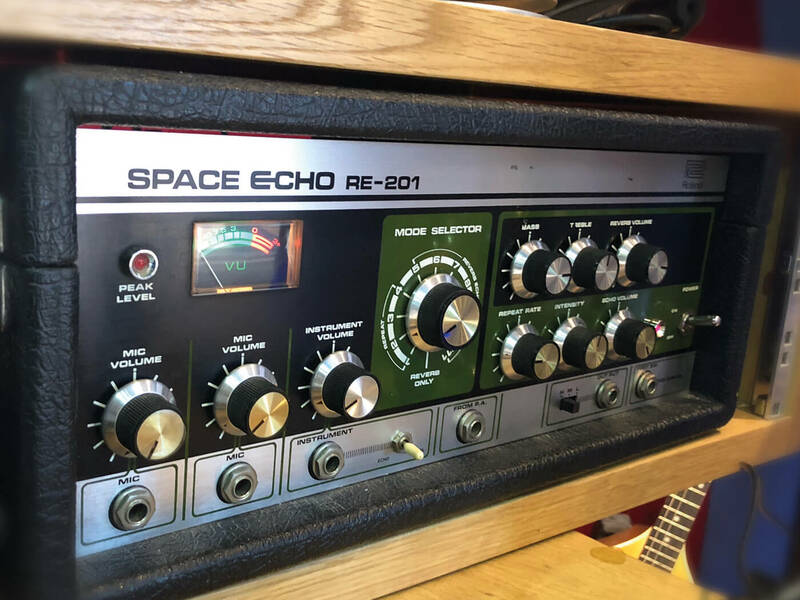 However, back in 1974, Roland managed to nail both a product number and a cool name with the release of its legendary RE-201 ‘Space Echo’. As I drooled over the back covers of late-70s and early 80s vinyl, I was drawn in by the name – here was an echo that went into space, or at least that was what my inner child was telling me. Then I saw one in the flesh and lifted its lid. Underneath that aluminium-panelled exterior, the top section opened to reveal its secret – which to be fair, you could probably already hear from the scratchy-swirling sound that was present from the moment you switched it on. It was a tape delay, and the sight of the snaking tape loop being drawn through multiple tape heads was enough to make any analogue diehard weep with joy. Sure, it was noisy, and really very large, but the moment you saw the tape, well, it reeled you in. In fact, the RE-201 offered a few input options; two for mics, and a third input for instrument signals, which could be controlled individually alongside the ability to balance the number of repeats and the delay time. An ever-helpful VU meter would offer indication of the incoming signal, in that haphazard way that most VU meters would. Once you get your hands on one of these, it is of course a prerequisite to play or sing into it and ramp up the delay time, while adding plenty of feedback. The resulting helium-inspired vocal taunts offers many minutes of fun, until you turned to the serious business of using it musically. As an engineer and producer friend of mine once said: “Simply put a drum loop through it and listen as the drum groove sharpens into focus and groove!” He was right, but it was equally at home if used with guitars. I was lucky enough to own two of these, and sold them both to a guitarist from a Shadows tribute band, as they were perfect for emulating that Hank Marvin sound. Once you’d had enough of the delay, you could always turn to the reverb. Oh dear – the reverb! So it was firmly spring based, but being at the smaller end of the spring-reverb scale, it didn’t sound as good as it could have done, in fact it was universally recognised as being a pretty divisive sound. I do know the odd person who liked it, but it didn’t resonate with me, leading many people to wonder why with the recreation of the 201 in a digital-pedal form, Roland chose not to offer a different reverb. Many considered that while delay was excellent, the reverb was as questionable as the original. Despite this drawback, there is still a huge amount of love out there for the Space Echo. I miss not having mine around, but I don’t miss the large size for something which is not only readily available in plug-in form, but something that has been modelled so well by the likes of Roland and Universal Audio that the only thing you’ll really miss is the noise of the swirling tape loop. 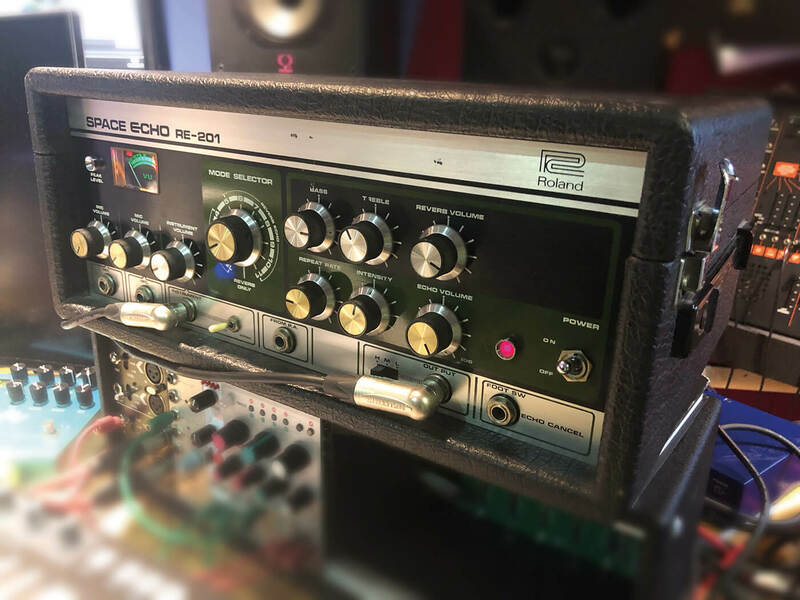 Other tape echoes came and went, including the RE-301 Chorus Echo and the SRE-555, but somehow, the RE-201 Space Echo was always the iconic one that became a mainstay of studios. That green, black and silver fascia was so recognisable and it remained in place from the first models in 1973 onwards (by 1990, the unit was discontinued). That’s quite a reign for a tape echo that literally came from outer space – or at least that’s what I wanted to believe.